Knowing how to fish in the wilds can help you survive, especially if you somehow lose access to your prepping gear or survival supplies. To make the most of survival fishing, you must first locate a suitable area, such as a fresh stream of water, a pond, or a river. Ideally, you should have some fishing gear in your bag such as bait, hooks, small weights, or swivels. It’s possible to find or create primitive fishing tools, but you can reserve your time and energy if you already have a fishing rod, small fishing gear, and spincast reels with you. Check ponds or streams to find ideal fishing spots. Some fish may gather in different areas according to the time of the day, such as early in the morning or late at night. Knowing fish patterns and the best fishing places is crucial to survival fishing. Start by searching the woods for long, sturdy wooden branches. Opt for green branches instead of brown ones since the former are flexible. Once you find a suitable material for the rod, attach your line to the tip of the rod, then secure the hook to the other end. If you don’t have a fishing line, look for vines or wires. If you’re near a beach or a pond’s edge, you might find a net that you can use as a line. Hook alternatives include large thorns or sharpened branches. Here are some survival fishing methods that you can learn so you can survive in the woods even after SHTF. Try this method using a pack of balloons. Aside from balloons, you’ll need several hooks and a good pair of reels. To start balloon fishing, inflate as many balloons as possible then attach the hook at the opening of each balloon. Attach your reel and lines to these hooks. This turns the balloons into floating bait. Fishing traps are one of the most ideal primitive methods. When camping near bodies of water, build fish traps. Use animal guts, then build a wall in the water. You can build the wall using branches, large leaves, stones, and tree trunks. The fish will be fooled into entering the trap with the flow of the water. Once the fish enters the trap, carefully catch it using your hands. The trap will function as a self-operating dam that can bring in plenty of fish. Another method is to simply catch fish using your bare hands. Like spearfishing, this method requires some practice and patience. The idea is to lure the fish to a shallow spot and force it to come out of the water so it can die slowly. Another option is to practice catching the fish in the water itself. Since fish can be too slippery to grab, don’t grasp it too tightly. Once you catch the fish, hold it gently then secure your grip so it doesn’t escape. Use a bucket or a large enough container to secure the fish you catch. If you don’t want to make a fishing rod, try spearfishing instead. A spear is easier to make, and you can create one if you have a regular knife. 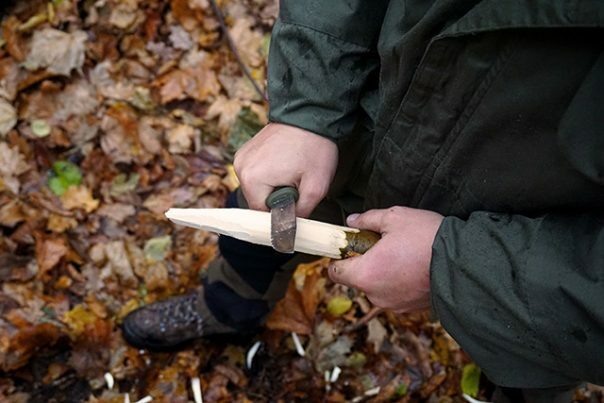 Start by finding a wooden branch that’s long enough, then sharpen one end with your knife. If you don’t have a knife with you, sharpen the spear by rubbing it using different angles on a stone. To start spearfishing, find a shallow spot at a time when fish are less active, such as in the morning. Aim for the fish and strike when the moment is right. Spearfishing might sound simple, but it requires some practice and a lot of patience. To improve your spearfishing skills, understand the basics of buoyancy. If you’re spearfishing by the sea, you’ll deal with buoyancy instead of gravity. It’s a waste of energy to fight buoyancy, so use a quick-release weighted belt instead of flailing around in the water. Bring a knife with you when spearfishing so you can easily cut yourself free from any hidden ropes or wires. Surviving on your own might seem like an impossible task, but as a prepper, you’d do well to learn and practice these survival fishing methods. To browse more articles about fishing, prepping, and survival, visit Preparedness.news.